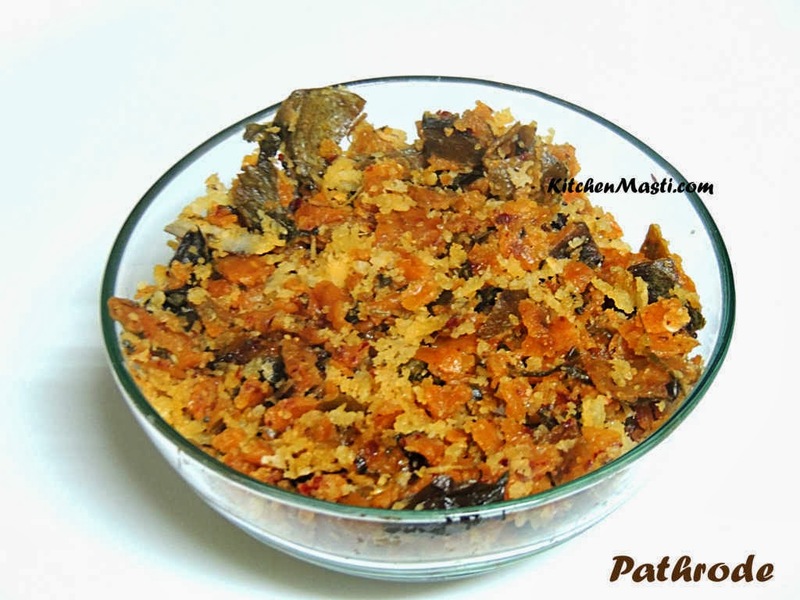 Pathrode as it is commonly identified in south India, especially in Karnataka is a very tasty snack. It is very suitable during the evening times to be served as a delicious snack. 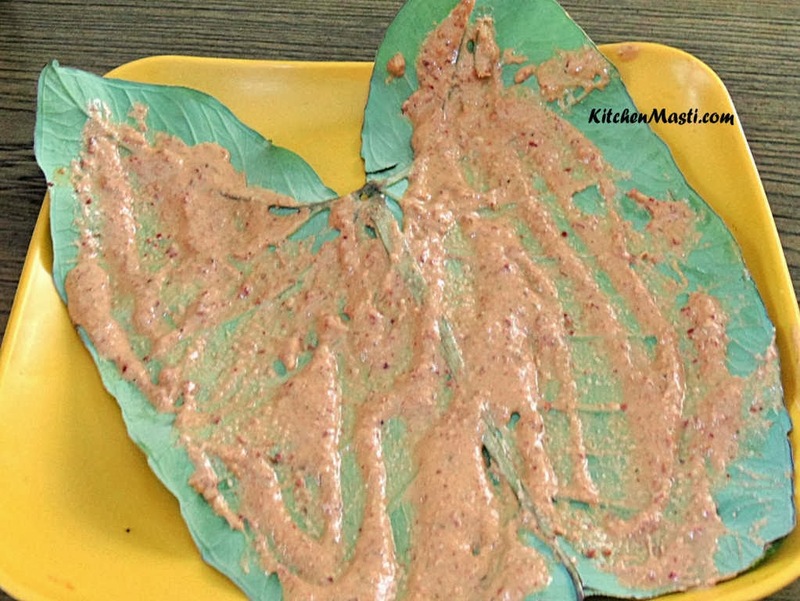 This is nothing but a dish prepared out of colocasia leaves or arbi leaves which is commonly used in other dishes. The root part of this leaf is called as arbi and you can prepare many dishes out of this. The main draw back of this leaf is that sometimes it has a tendency to leave behind a itchy feeling on your tongue if the leaves are not that tender enough. It is rich in iron content but not recommended for diabetic patients. Again there are many types of colocasia leaves like Bombay leaves or black colocasia. One interesting fact is that one variety of this species grows on the tree which is very tasty but nowadays this variety is scarce. Different dishes can be prepared out of these leaves. Today, I am going to show one such variety. This is a bit lengthy process and it requires around 1 hour and thirty minutes. The ingredients mentioned here is enough to serve 4 people. Colocasia leaves - 7 - 8. Coconut scrapings - 1 /2 cup. Red chillies ( byadige ) - 7. Coriander seeds ( dhania ) - 2 tsp. Jeera seeds ( cumin seeds ) - 2 tsp. Mustard seeds ( methi seeds ) - 1/2 tsp. For tadka ( seasoning ) - 1 broken red chilli, 1 tsp Urad dal , 1/2 tsp mustard seeds, 3 tbsp coconut oil and a few curry leaves. In the mean time, let us wash the colocasia leaves. Overturn the leaf and just slightly scrap the thick veins which is clearly visible with a clean knife. Now gently wash it under the tap water. Keep it aside for a few minutes so that the water gets drained off. 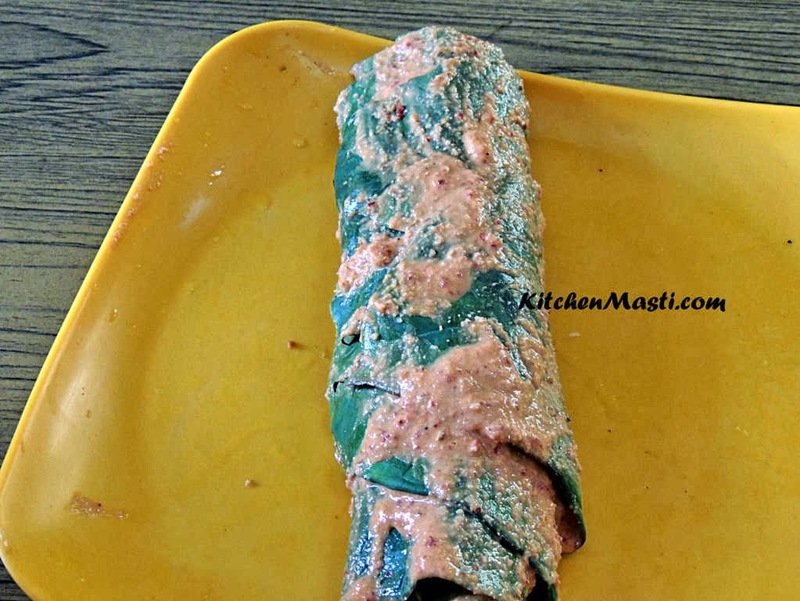 Now grind the rice along with coriander seeds, red chilli, jeera seeds, salt, jaggery, tamarind and dry roasted urad dal and fenugreek seeds to a smooth texture by adding as little water as possible so that the batter resembles that of idli batter. ( slightly on the thicker side). Now overturn the leaf so that the rougher surface is facing above. 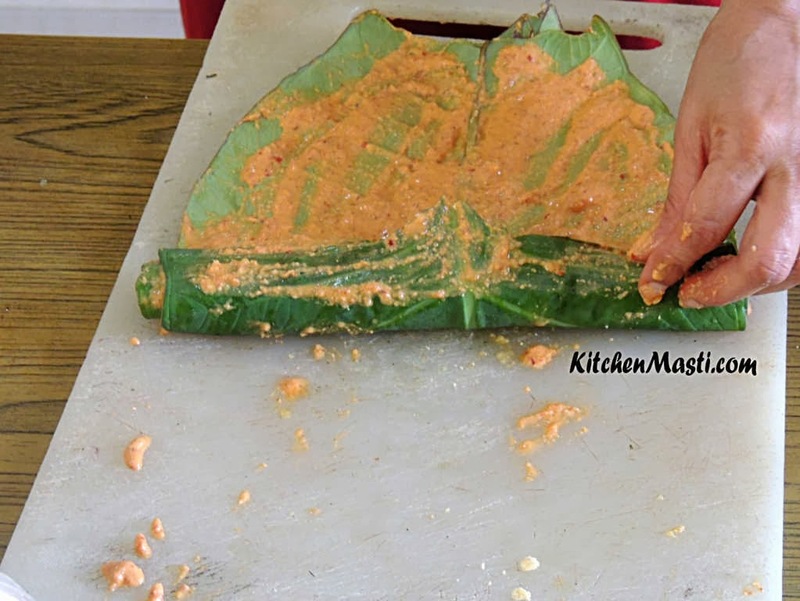 Slightly smear the ground batter on the leaf and roll it slowly as shown in the below photos. Place it in the cooker and boil for around twenty minutes without placing the weight. When it cools, remove it from the cooker and chop these boiled leaves into small pieces with a knife. Heat a big pan and prepare the tadka by adding coconut oil followed by Urad dal, mustard seeds red chilli and curry leaves. Now add jaggery and coconut scrapings and fry for around 1 minute in medium flame. Add the chopped leaves and mix it well. Now your tasty pathrode is ready to be served.!!! If you do not prefer too much of sweetness in your pathrode, then you can decrease the amount of jaggery. See to it that the tamarind is added in right quantity or else, you will get a itching sensation. So, it is very necessary to select the right type of leaves. If you do not like the taste of coconut oil you can use any other oil also.